Yingmei gave us an oral guided tour around her imagined solo exhibition at VISUAL in 2013. As in a dream, Yingmei’s description did not match the physical reality of VISUAL’S spaces. This was an audience dependant performance in more ways than one. The audience did not simply look and listen, they were invited to imagine being in Yingmei’s dream, in it’s every detail. Through her heavily accented English she described several themed exhibition spaces. At one time walking us through a pastoral landscape installation she asked the audience to make the ‘voice of a cow belling’, the sound of a cowbell. She also projected her performative presence by acting out a future performance piece. She then walked in front of us, crouched in typical Asian fashion, and began to sing a haunting Chinese lullaby. 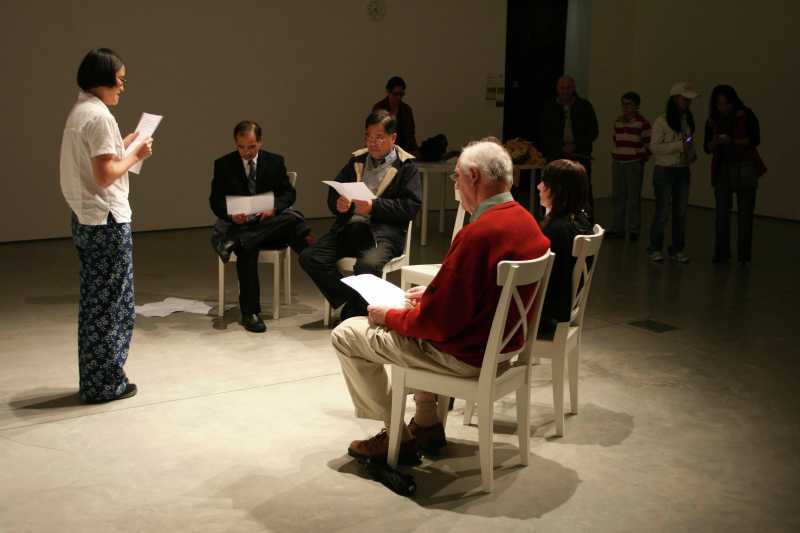 The performance was engaged with directly by an audience seated on chairs set up in horseshoe fashion around the middle of the room and also by passive observers who watched the performance from the back of the gallery. Yingmei left the room with the six chairs in horseshoe formation in the centre of the room with the detritus of the previous performances dotted around the periphery of the space.